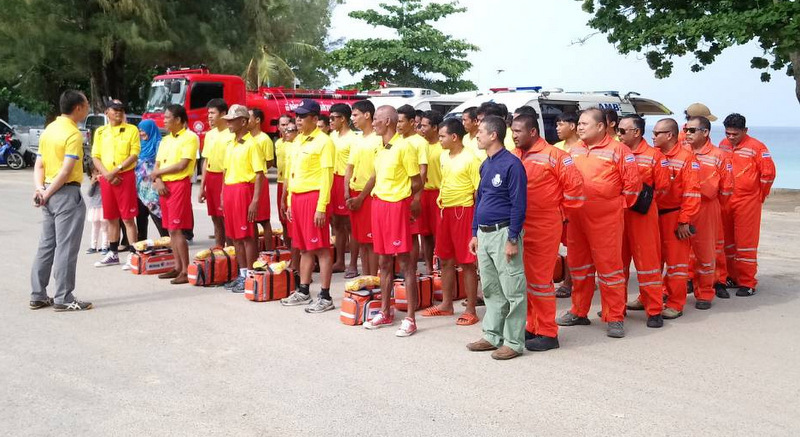 PHUKET: The state of having lifeguards patrol Phuket’s beaches took several dumbfounding twists today, with 27 lifeguards presented to the Phuket Governor as “already” working – but dedicated to patrolling only the beaches at Surin, Bang Tao, Nai Thon and Mai Khao. The lifeguards presented themselves to Governor Norraphat Plodthong at the car park at Surin Beach at 9am, accompanied by Dr Nutpol Sirisawang, Managing Director of the lifeguards’ employer, LP Laikhum Co Ltd.
Bangkok-based consultancy LP Laikhum Co Ltd in February was quietly awarded a government contract offered by the Phuket Provincial Administration Organisation (PPAO, or OrBorJor) to provide 98 lifeguards to patrol Phuket beaches from Mar 1. • and a further B3.807mn to provide essential lifeguard services in Kathu District (including Patong and Kamala). However, without even recognising that LP Laikhum had failed to uphold the terms of the contract by not having lifeguards on the beaches by Mar 1, Dr Nutpol today spoke as if the previous contract was no longer relevant – a fact that might be true, though both Dr Nutpol and Governor Norraphat failed to mention it this morning. “Today is the first full showing as ‘encouraged’ by the Phuket Governor. We started patrols on April 1 at Surin, Nai Thon, Mai Khao and Bang Tao beaches,” Dr Nutpol said proudly. Governor Norraphat today blankly supported that understanding. “The Phuket OrBorJor (PPAO) just made an official contract with LP Laikhum Co Ltd today (April 5),” Gov Norraphat said. 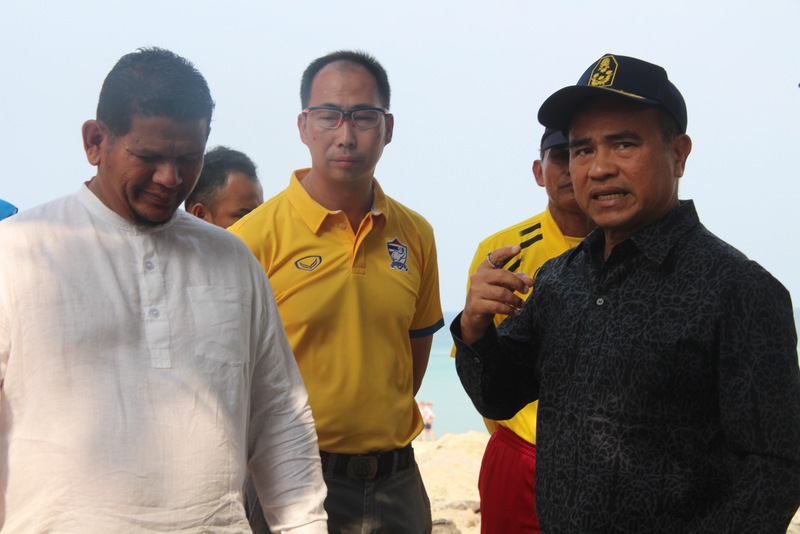 “Internal management by the Phuket OrBorJor is complicated, which resulted in a gap (in providing lifeguards on Phuket’s beaches) in March this year,” he added. 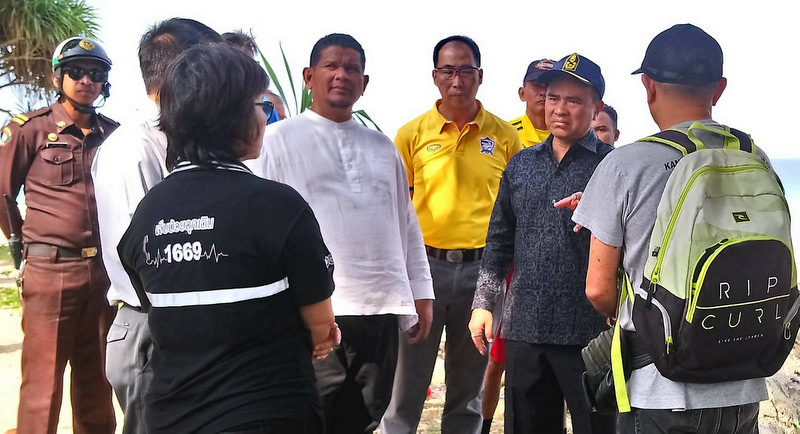 “Some beaches, including those in Patong and Karon municipal areas, will find their own lifeguard teams by themselves because they demand to manage themselves,” Governor Norraphat said. However, Gov Norraphat’s own statements today flew in the face of his own order on Dec 12, when he ordered the PPAO to no longer be involved in organising lifeguards for Phuket. No explanation was given for the now “new” understanding of how lifeguards are to be provided on the beaches, including how much LP Laikhum is to be paid to provide the 27 lifeguards to partol the northern beaches only. Dr Nutpol brimmed with confidence this morning. “I operate this company, our base is in Bangkok. 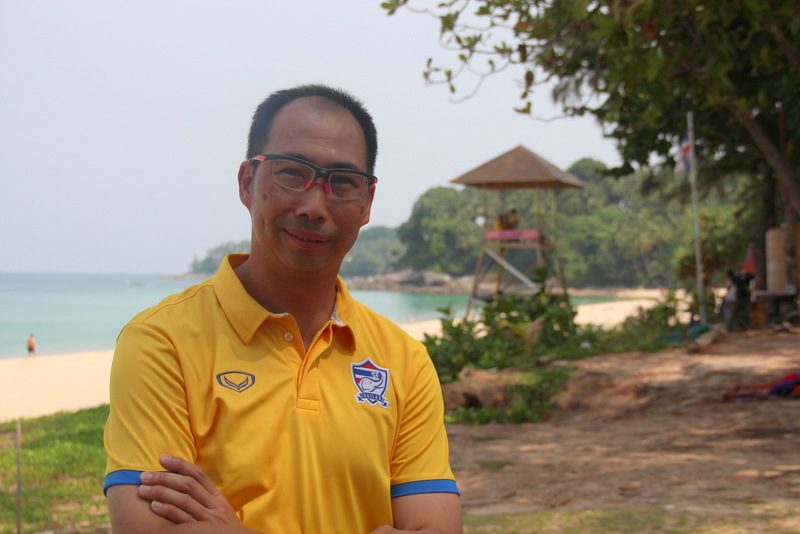 I am confident in improving how lifeguards in Phuket are managed, as we did about 10 years ago,” he said. “Also our company is joining with some Phuket people and a well-known security company.” he added. However, Dr Nutpol failed to identify which security company was so important to mention, and failed to explain what relevance the security company had when it came to surf rescues. Dr Nutpol denied that his lifeguards were poorly trained. “On every patrol, we have lifeguards who have experience in ocean rescues in the Andaman region. They are not just experienced in swimming pools, as others have said,” he claimed. “Our lifeguards’ certificates have been issued by The Royal Life Saving Society Canada. They have completed the life saving instructor course conducted by Thai Life Saving Club Surf lifesaving trainer through a course organised by the Phuket OrBorJor,” Dr Nutpol added. “We are just starting. Don’t judge us too fast,” Dr Nutpol said. Judging someones qualities by looking at him.Typical expat attitude.Sorry for you,but David Hasselhoff and Pamela Anderson were not available. some of them look a little on the old side for life saving. not to mention the beer guts etc. they look like dad"s army. i suspect its the same old thai razzle dazzle scenario, stuff any body in a uniform and suddenly they become what the uniform stands for.i wonder who"s going to rescue them when the monsoon seas hit and they are forced to perform a rescue ? A contract to provide 98 lifeguards now comes up with just 27 while the Governor whines that Patong & Karon areas are somehow now out in the cold. Many things wrong with this, from the contract-granting by an unauthorised PPAO to not accepting responsibility & contract-breaking. "we are just starting,don't judge us too fast".Wishful thinking.Probably never read comments on here.Quite a few of those experts/expats here are well known for their prejudgements . I also feel that the previous move by the International Surf Lifesaving Association to formally request the US Department of State to issue a Travel Advisory is still warranted. All tourists need warnings of the dangers of swimming in Phuket without trained lifeguards on the beaches. These new kids have zero knowledge of the local beach characteristics compared to the former local lifeguards. And the moronic process by Thai officials continues. It'll be curious to see how these newbies hold up when we get barraged with high winds, high surf...and drunk Chinese and Russians on the beach. I think we're gonna see many of these guys sh***ing themselves when the Andaman start showing it's teeth. These guys have nowhere near the experience needed with local beaches.